The saying goes that a picture is worth a thousand words. For Jessica Carr, analyzing visual culture is a way to reveal the complexity of relationships that may appear simple on the surface. 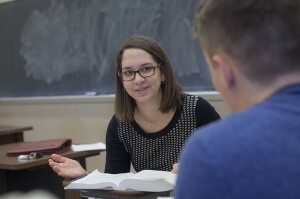 Jessica Carr, assistant professor of religious studies, teaches a course in Pardee Hall. In her forthcoming book, tentatively titled The Zionization of America: Palestine in Jewish-American Visual Culture, 1901-1948, Carr explores how images of Palestine – Jews and non-Jews living there, the landscape, and the built environment, including the Temple in Jerusalem, ruins, and new architecture – played a role in how early 20th century Jewish Americans defined what it meant to be Jewish during that time. The early 20th century also saw the development of Zionism, the idea of Jewish nationalism that usually focused on Palestine as a homeland for Jews. Carr points out that the circulation of images, including photographs and artwork, became more prevalent during this period thanks to technological strides made a century earlier in producing and reproducing images. Also, many non-Jewish Americans, particularly white Protestants, circulated images of the Holy Land, so for Jews to do the same allowed them to participate in a broader cultural phenomenon shared with Christians while also claiming those spaces as distinctly Jewish. Those complexities are what drew Carr to major in religious studies as an undergraduate and what she hopes to reveal to her students in the classroom, where she integrates classic texts with religious practice and encourages open discussion. Learning to analyze texts in social and historical context allows students to approach different systems of meaning in a non-judgmental way. Often, Carr raises tough questions and research problems usually reserved for graduate students. Carr plans to include students in a digital archive project for which she will collect images of women in Jewish culture from various time periods, geographic locations, and material forms. The archive is an extension of her next book project on images of women in Jewish visual culture. Carr explains that although 20th century movements from Reform to Zionism rejected the authority of halakha (rabbinic laws apart from Biblical law), including constraints placed on women, they created visual cultures that often erased women’s bodies. A survey of images from the medieval period to the 18th century and later suggests that Jewish tradition offered a variety of images of women. Carr plans to compare those sources, including illuminated haggadot (a guide to the liturgy of the Passover Seder) and the Tsene Urene (a Yiddish translation and midrashic commentary popular in 18th century Eastern Europe), to Jewish-American visual culture to analyze the depiction of women, female roles in those depictions, and how those images illustrated, interacted with, and altered the meaning of Jewish texts and traditions. Am pleased that Prof. Carr has pursued our Jewish heritage in the U.S. and wish her success in the future projects she tackles.